A restaurant divider with a dash of elegance. With restaurant divider Facet, you immediately create an elegant interior. It is such a beautiful, one-of-a-kind piece, it is sure to amaze your guests and create just the right ambiance for a lovely meal at your restaurant. Are you in the market for a restaurant divider that will add a certain flair to your interior? People come to your restaurant to have a delicious meal. The food is very important, but don’t forget about your presentation. 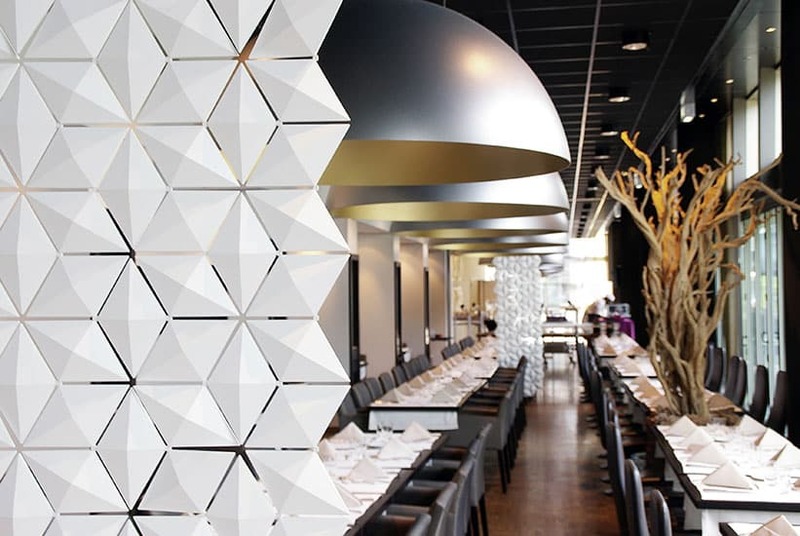 Look no further, our restaurant divider Facet is your answer! This lightweight screen with its intricate pattern complements any style or architecture. It does not take up a lot of room and the fact that it is slightly transparent, means your guests won’t feel cut off from the rest of the restaurant. When eating at your restaurant, your guests want some privacy, but they do not want to sit in a completely separate room all by themselves. Facet provides the perfect solution. With this restaurant divider, you give your guests their desired privacy, without giving them the feeling of total seclusion. Facet gives just the right amount of privacy for a restaurant setting. You can even adjust the amount of privacy. 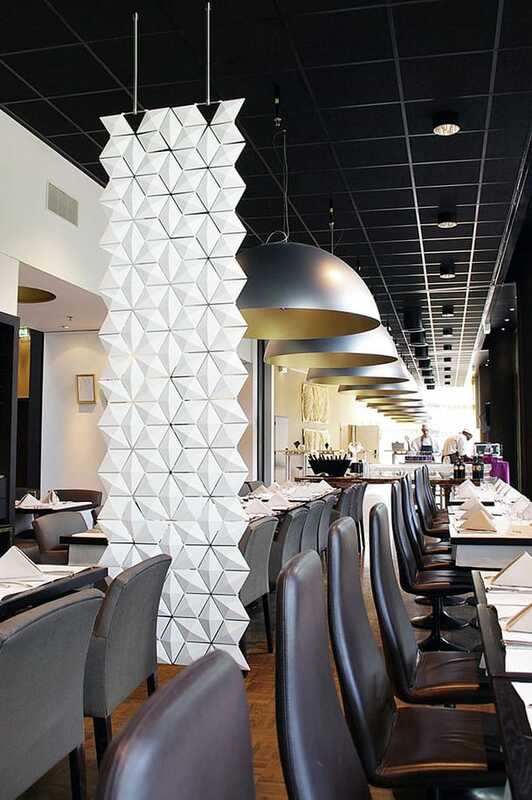 Our restaurant divider consists of separate diamond-shaped facets that can rotate. By rotating them you can adjust the amount of transparency of the panel. Keeping them straight gives you the maximum amount of opaqueness, but flipping a few diamonds around, will make it more transparent. This will also alter the pattern slightly, making your restaurant divider truly unique. We offer you many ways in which you can make sure that your restaurant divider suits your specific needs. We can make it in absolutely any size – from a panel of 34cm to three meters or more. It also comes in a variety of beautiful colors. The installation of Facet is extremely easy. The ceiling attachments are made so that they can be mounted to any ceiling with just one screw per attachment. This is possible, because Facet is made of lightweight yet durable material. Interested in using our restaurant divider for your project? Visit our online shop for all the information and possibilities. Any questions or a special request regarding your order? Feel free to contact us by phone or email – we are here to help! The restaurant dividers featured here are installed in the restaurant of a chic hotel in Amsterdam, The Netherlands. The ceiling attachments are custom made for the high ceilings of the restaturant area. Facet divides the large dining area into smaller spaces without changing the open character. This enables guests to experience a more private and cozy atmosphere while enjoying their meal.